You may have noticed that I don't usually post about people who've been born physically "different" from the rest of us. Although I think all human differences should be embraced, I find many such stories to be in bad taste. So I didn't write about a little Indian girl named Lakshmi when I first became aware of her existence many months ago. When the news about Lakshmi first broke, she was facing a very complicated surgery, and there was a very good chance she might die. I didn't think it would be a good idea to post about her, but even then, I found her story quite moving. 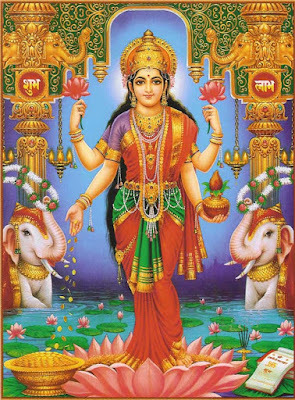 You see, instead of treating Lakshmi like a freak, the people of her village in India believed she was an incarnation of her namesake--the eight-limbed goddess Lakshmi (shown above)--and revered her accordingly. Lakshmi's surgery was a success, and she's now a healthy, happy little girl. Tonight, the television show 20/20 will have a segment on the previously eight-limbed girl, and you can read more about her (and see a short video) here on the ABC News website. I loved that story! But I couldn't find any pictures :P Thanks for posting it! There was a different girl born in India awhile back who had two faces. They revered her as a goddess as well. Jin Ai: Yes, that will be my focus from now on. BTW: Nope, wasn't on the UES on Monday. Did you think you saw me? I have many doppelgangers. Aw, that's touching (poor girl) ! Kiki: I've been long awaiting to tell you about an interesting topic: Demeter perfume company. Instead of making lovely fragarances of lavender and pine cone, they create smell "memories". Such as Playdoh or pb and j to bring you back to your childhood. Or Wet Dog to remind you of poor old fido...www.demeterfrangrance.com. I really do love this story. It's wonderful how people have accepted her, and even turned her disability into something as positive as possible. I knew about this before too, but only saw pictures through an ultrasound of the mother's womb, I think. xD It's nice to see her actually alive. I read about this. She was hailed as a reincarnation in her village. I remember reading a story about these boys born in India with one body. Their parents made money out of them, 'cause they were 'freaks.' Sad, isn't it? what did her village think of her after the surgery (?)? was she still a goddess, or just a little girl? do you know? am i asking too many questions? Anonymous #1: Thanks for the tip! I've always thought the smell of freshly-cut grass is the best smell in the world. Anonymous: Yes, she can walk now. Amazing, isn't it? Raph & RI: Thanks for the tip! ss chick: Yes, some of her neighbors still consider her a goddess. If only there was a goddess of really long tangly hair:)rofl!!! HOW CAN SHE USE THE BATHROOM!? I'm glad she's got the normal number of limbs now, and I hope her neighbors come to realize she's just an ordinary girl. It would be awful if people expected her to do miracles and then she couldn't, everyone would get so hurt and disappointed. =) Unless she truly is a goddess, of course. oh i hope lakshmi lives poor thing . . .
) but sadly they got rid of the extra ones . . .